Freedom is finally within my grasp. Tomorrow they’re removing the pins from my wrist and I get to see if this has all be worthwhile, and also just how much more recovery I have to do. I can’t say I’m looking forward to it, although I am looking forward to getting rid of the cast once and for all. These last few weeks have been challenging, my patience has been wafer thin – which, as I said to my husband – has a lot to do with how frustrated I am with myself than anything to do with Pippin. 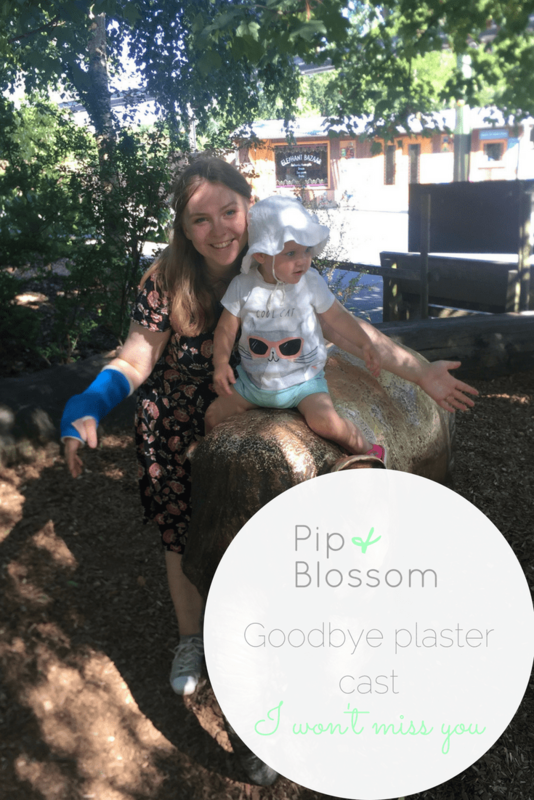 Pip herself has become more inquisitive and more determined to do things for herself than ever before and that has been challenging. It’s been the first time that she’s reached for her dad over me, and even the breastfeeding has started to decrease. It’s hard not to read into that a reflection of how she’s feeling about me right now. I’ve found myself saying no an awful lot, which I know is a pointless exercise because things go a lot more smoothly if I talk to her calmly and face to face! I even found myself, after telling her four times in a row not to pull the seedlings up, that she wasn’t allowed in the garden anymore. Way to go on an idle threat, and also not really the parenting style I strive for. So I’m feeling a bit fraught, guilty and sore. I know my shortness of temper comes from feeling out of control. I’ve caught myself shouting in frustration at my inability to do my hair, or buttons – or even when Argos wouldn’t confirm my transaction. This isn’t me. I’m not serene by any stretch, but I’m not usually so tense. I’m just trying to remember that Pip isn’t being naughty, that she’s learning all the time and following the naturally inquisitive nature we are working to foster. I also have to remember to cut myself some slack, I’m sore and things are a little more difficult right now. I’ve never been very good at letting go of things, or delegating so I’m very much on edge, but sometimes you have to remember to rest and heal. And if Pip is learning all the time then so am I. Each stage of her development is a new stage in motherhood for me and we’re both taking this journey into the unknown together.